The Mayor's Alliance for NYC's Animals sponsors or co-sponsors several large adoption events each year, all with the common goal of finding homes for New York City's homeless cats, dogs, and rabbits. In addition to offering pet adoptions, some of these events also feature low-cost microchipping, dog licensing, and other services that promote responsible pet ownership. All of these events are family-friendly and fun! These pet adoption events, held by Alliance Participating Organizations (APOs) at locations in and near New York City, offer an excellent opportunity for you to meet and adopt your next companion animal — that is, your new best friend! Think spaying or neutering your pet is too expensive? Think again! 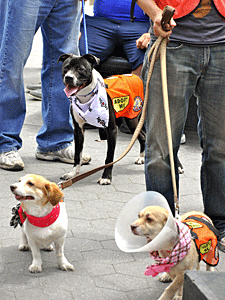 Low-cost dog and cat spay/neuter surgeries are available at special spay/neuter events in New York City. Having your pets microchipped is one of the best ways to increase the chance that, if your pet becomes lost or stolen and winds up at an animal shelter or veterinary office, he or she can be returned to you. The Mayor's Alliance offers low-cost microchipping clinics at a variety of events throughout the year. Whether you're looking for a swanky gala benefit, casual gathering of pet lovers in the park, luxury boat cruise, musical concert, comedy performance, dance party, film screening, marathon or walk, family bowling day, convention or fair, flea market or yard sale, boutique shopping day, pet fashion show, cage comforter sewing day, or other animal-related fun, these events sponsored by APOs and other New York City animal rescue and advocacy groups should not be missed! These classes, workshops, and other educational events are sponsored by Alliance Participating Organizations (APOs) or other New York City animal groups to give you the information and skills you need to help both your own pets and other NYC animals. Visit the New York City Feral Cat Initiative website for a list of workshops and other events specifically related to Trap-Neuter-Return (TNR) and feral and stray community cats. Alliance Participating Organzations (APOs) and other NYC animal groups are asked to submit their upcoming events for publication on our calendar.